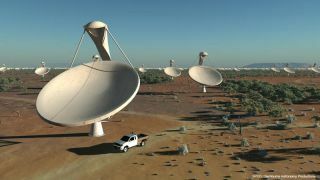 An artist's interpretation of the Square-Kilometer Array, a huge radio telescope currently under development in Australia. Scientists may have an extra challenge when it comes todetecting alien civilizations: a time limit. A new study suggests that intelligent aliens, if theirtechnological progression is similar to that of humanity's, are likely to havemoved away from noisy radio transmissions to harder-to-hear digital signalswithin a 100-year time frame. That offers Earth just a narrow window in whichto pick up any signals from extraterrestrialcivilizations.? "Based on the results that we looked at, if weassume that the civilizations are humanlike with similar technological progressto us, we calculate the probability of making contact is roughly one in 10 million,"the study's lead author, Duncan Forgan, told SPACE.com.???? Forgan and his team applied their technology-developmenttime scale to a simulation of the galaxy, based on the assumption that the paceof an alien civilization's technological progress would be similar to that onEarth. Based on this simulation, the researchers determined the 1-in-10 millionodds of humans accidentally stumbling across a transmission from aliens. The researchers, whose study will appear in an upcomingedition of the International Journal of Astrobiology, focused their work on theexpected eavesdropping capabilities of the Square-Kilometer Telescope, a radiotelescope slated to be completed by 2023. In the early 20th century, the only options for communicatingquickly over long distances were by telegram or wireless radio. As radiotechnology improved, so did the quality of its broadcasts andreceivers. "In the past, the detector would only take up achunk of that energy, and the rest would go out into the universe," Forgansaid. "Now, instead of firing off a huge amount of energy and picking up atrace, we send out a very small amount and soak up almost all of it, so theamount of lost energy is much lower." Traditional radio communication is being replaced by innovationsin the use of light to send digital signals through fiber-optic cable and theemergence of the Internet. The transition from analog to digital broadcasts,which in the last few decades recoded radio signals into formats that preservedtheir clarity over long distances, has further cut down on Earth's signalleakage into the universe. To determine the Square-Kilometer Telescope's chances ofpicking up a radio broadcast from intelligent extraterrestrials, scientistsused simulations similar in structure to that of the famousDrake Equation.? While that formula (created by astronomer Frank Drake) spatout a single number for the amount of contactable civilizations by stringing togetherseven factors deemed critical to the formation of intelligent life, the programused probabilities to create a spatial distribution of a galaxy's stars andplanets. "What we're doing is approaching it from a differentangle," Forgan said. "Instead of squeezing huge amounts ofastronomical data into several numbers, we're going to use as much of it aspossible." The scientists attempted to create a statisticallyaccurate picture of our galaxy by using data on typical star masses, locations,number and masses of planets, and their habitability. According to theirsimulations, civilizations on par with the technological development of humanscould be separated by distances of at least 1,000 light-years or so.?? One type of simulation examined a scenario in which allintelligent alien life became radio quiet ? ?a realistic scenario, Forgan said,because signal leakage lessens steadily as technology improves. Another type lookedat civilizations that Earth could see during the planet's entire lifetime. "When you do that, the possibilities improveimmensely; it goes from being a remote impossibility to being much, muchhigher," Forgan said.??? The concept of radio quiet doesn't affect the change indistance, but it affects the time scale during which you can hear the signal,he added.? "If your target is broadcasting for 1,000 years,then this gives you more time to find it before the signal switches off than ifthey were only broadcasting for 100 years," Forgan said. "The 'radioquiet' concept reduces the time scale to a very low number, which means yourchances of hearing it are very small." What this means is that searching only for radio leakagescould cause scientists to miss "quite a lot" of civilizations, Forgansaid. "These results aren't as new as you may think, butthey are exciting because it shows that even the most powerful radio telescopesin the world will still struggle to find E.T. unless we design thesearch carefully," Forgan said.??????????? Previous studies on the observation limits of theSquare-Kilometer Telescope showed it could detect extraterrestrial signals fromup to about 300 light-years away within two months, assuming that the othercivilization's broadcasts were at least as strong as the military radar used byEarth's governments. Will we ever detect life???????????????????? Scientists continue to use radio waves to searchfor life because of the scarcity of natural sources of radiowaves in the universe, and the fact that they are less easily lost byabsorption than other forms ofelectromagnetic radiation, which includes light. Even the smallest snippet from an alien broadcast couldcount as evidence of an extraterrestrial intelligence. "An artificial signal will have patterns in it thatusually do not appear in nature, even if distorted," Forgan said. Alternate search targets include technologies thatpossess a distinct radiation signature, such as the exotic matter createdinside a particle accelerator, and technologies that have not been invented yeton Earth, such as communication by lasers or neutrinos. But doesn't mean humanity should give up on radio: Ratherthan look at the steady drip of leakage that results from our televisions,radio or radar, we could look for alien civilizations that are making a generaleffort to communicate with us, Forgan said. That approach, he admitted, is likely to mean a long waitfor any cosmic callbacks. "If we send a signal right now, it will take fouryears to reach the nearest star," Forgan said. "It's much more likelywe will receive a return message in hundreds or thousands of years. "On the other hand, other civilizations may have adifferent outlook. They may be desperate to make communication with othercivilizations." Poll- Is Earth Ready to Meet an Alien Civilization?